Once again, a very necessary and well-written blog post. I agree. Wow, 1909. Nothing new under the Sun or above it. 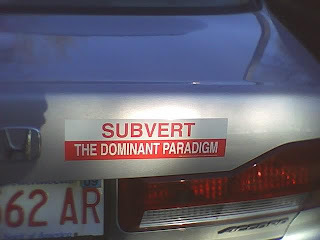 That paradigm would quickly subvert itself out of existence. Then the bumper sticker guys can get back to business. I'm sure there is an element of "because we can" involved. However, that attitude is illogical and ultimately self-defeating. The "Dominant Paradigm" is Capitalism. Today it is Monopoly Capital - now in control of the U.S. Government - i.e. "dominant". Nothing in our society and culture escapes the capitalist paradigm (greed). If one is lucky (unlucky?) enough to stumble across a political theory Prof. who understands the "dominant paradigm" - what it is and the damage it does this statement makes perfect sense. I have a bumper strip I bought in 1996 just off the Boston Commons hanging on the wall of my den...I love it and believe in its meaning totally!